The University of New Mexico on Monday unveiled the floor design of the new Pit floor, featuring a large Lobo logo at the center of Bob King Court and the familiar “The Pit” painted on both baselines in white lettering on a cherry background. Also, a sign of the social media age, the university’s #GoLobos hash tag is included as part of the design on the sidelines, visible to fans in the arena and on televised games. There are also sideline advertisements on both the east and west sides of the court for Bank of Albuquerque and on-court ad placement for Verizon. 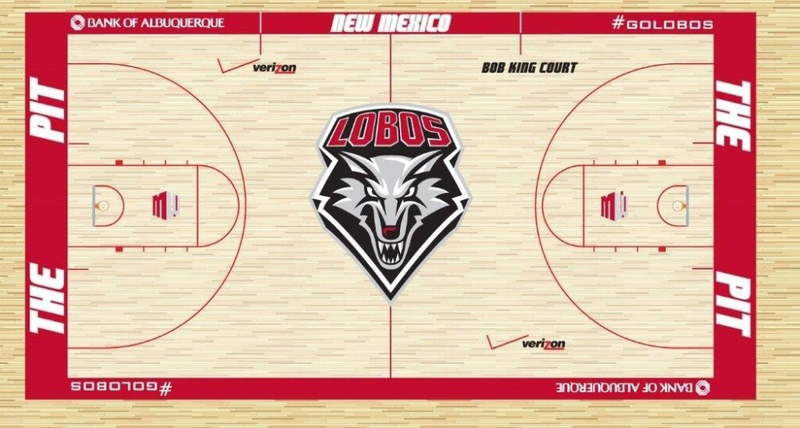 “Bob King Court” will appear in front of the Lobos bench on the court and two Mountain West Conference logos appear in the free throw shooting lane on both ends of the court. The university spent $130,000 this offseason to replace the hardwood Pit floor with the replacement beginning in July. While the floor has been installed, it has yet to be painted. The Lobo Club on Aug. 23 held a fundraising auction in which the old baseline pieces spelling out “The” and “Pit” from the south baseline of the court drew a $20,000 bid.